This printed report was submitted to the Kansas Territorial Legislature by Gov. Medary on January 4, 1860. 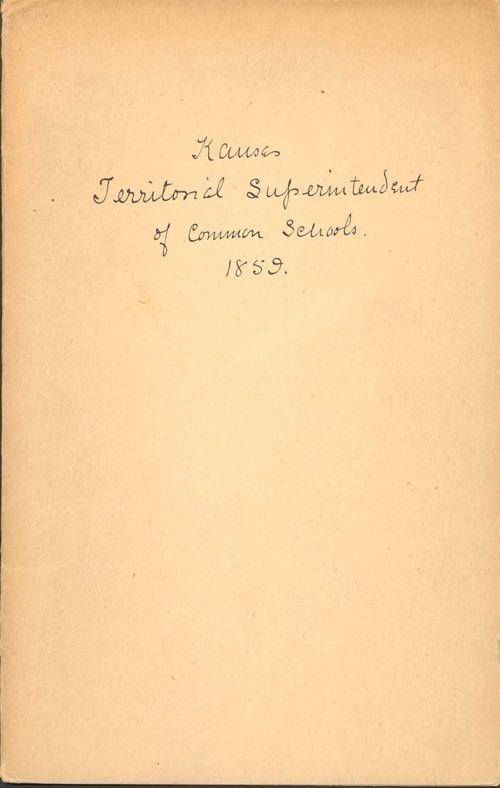 S. W. Greer, the Territorial Superintendent of Common Schools reported that fifteen counties had submitted reports and schools were taught in 136 districts comprising 7,029 children. He reported on how he visited school districts and included some information on various types of schools in the state. He wrote that the pay for the superintendent was inadequate, due to the value of territorial scrip being worth 30 cents on the dollor. He indicated that he had to use $500 of his own funds in the past year. He wrote about the need to establish normal schools (for training teachers) and to hold teachers' institutes. He wanted to increase the standards for teacher qualifications. He also discussed various aspects of educational methodologies of the period. He included short reports from the following counties: Douglas, Anderson, Jackson, Nemaha, and Osage as well as some statistics from all organized counties. This report was taken from the Journal of the House of Representatives, Kansas Territory, 1859, pages 34 through 82.